Capcom Teams Up With JRPG Studio for "Truly Interesting Things"
Capcom has joined forces with JRPG and Professor Layton developer Level-5 for an "interesting" project. Who doesn't Capcom team-up with nowadays? After unveiling multiple collaborations at this year's Tokyo Game Show with studios such as Ninja Theory (DmC), CyberConnect2 (Asura's Wrath), and From Software (Steel Battalion Kinect), it's also been revealed that the company has something secret in the works with Level-5. Level-5 is known for the Professor Layton series along with other titles such as Dark Cloud, Dragon Quest VIII, and the upcoming Ninokuni. Its most recent release outside of Japan was Dragon Quest IX. A business information website recently posted an interview with Capcom's Keiji Inafune and Level-5's Akihiro Hino where the two confirm rumors that they're in cahoots, and it was instigated by Capcom. Inafune said: "This rumor is true. Right now, the two of us, with our staff, are working together on some truly interesting things. Even though Mr. Hino is younger, he's someone I respect. I wanted to try working with him, so I contacted him." That's all we know, but I have three completely valid predictions about where this collaboration could go, aside from a brand new IP. First, Capcom's JRPG series Breath of Fire has been absent since Dragon Quarter came out in 2003, so it's ripe for the picking. A Mega Man Legends revival has been rumored lately, and Level-5 would likely do a great job with that. But the most likely of possibilities would be, you guessed it, Street Fighter vs. 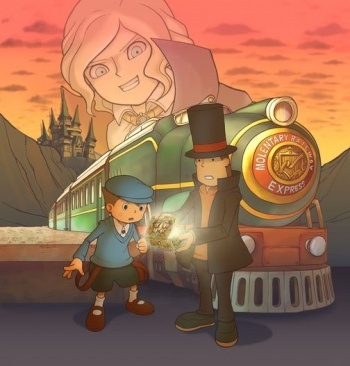 Professor Layton. After all, a true gentleman leaves no puzzle unsolved, and no fight unfinished.